The SPCA recently offered a free adoption special for three days to try to reduce its overcrowded cat population. The pink sign on the shelter door said a lot about the feline predicament the SPCA finds itself in these days. “We cannot accept any cats at this time as every cage in this building is full,” the signs reads. Read on, and you learn there’s a three-month waiting list to surrender a cat and an appointment is required. It’s a serious problem. A lot of cats, and this is not even kitten season yet, and the agency’s foster homes and shelter are full. That’s why the agency – on short notice – offered a free cat adoption special for three days, which ended Saturday, for cats 5 months and older. 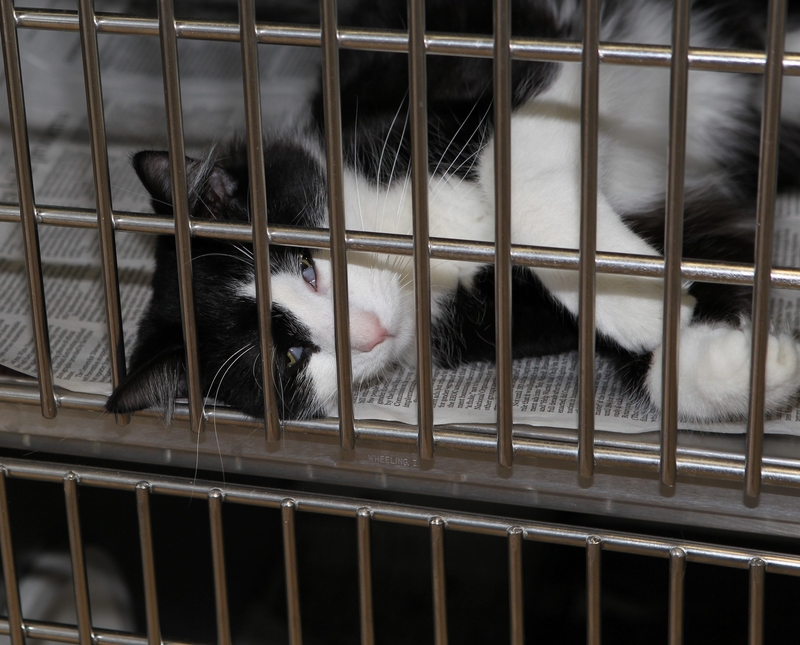 “Garfield,” a 1-year-old black and white longhair, was one of the lucky ones. A Hamburg woman and her 15-year-old daughter, Lindsey Stebbins, settled on him as their choice. During the three-day campaign, 58 cats were adopted out, Browning said late Saturday. But many more await adoption. Foster homes are filled and animal agencies are backed up on spaying and neutering cats. And, the waiting list policy that took effect since the agency ended euthanasia five years ago now appears to be contributing to the explosion of cats needing homes. “The waiting list is responsible for crowded foster homes, but as a result, we’re saving lives,” Browning said. The numbers help tell the story. As of Saturday morning, the agency and its off-site locations had 100 cats and kittens, plus another 185 in foster homes, and another 48 on a waiting list to be surrendered. Garfield – with a pink nose, and soft, velvet-like fur – became the Stebbins’ choice. They were smitten with others at the SPCA shelter in the Town of Tonawanda and also spent considerable time playing with Lemon Grass, a 3-year-old brown tabby; Jack; and Little One. But in the end, Garfield strutted his stuff in the visitation room, as if to “impress” them. He will join a rabbit and their other cat, Belle. “Because he had a medical issue, I don’t think anybody else would take him,” said Julie Stebbins, noting that Garfield suffers from a cornea problem in his left eye. With more than 300 cats in the SPCA’s system, the agency decided to take action. “We decided we have to really jump on this, so come May, we have enough room to bring in more cats,” Browning said. The offer pulled those looking for a cat and others just looking casually. Darlene Derk and her boyfriend, Dennis Ovitt, made the drive from Angola to the shelter, in search of a companion for their older cat, Ziggy. They planned to do serious looking Saturday – even if the hunt meant going to SPCA satellite sites in the Walden Galleria and Eastern Hills Mall. “We want to make sure we have the right one. We want to be the ‘playmate,’ too,” Ovitt added. As the owner of three rescued cats, Lynn Bishop of Kenmore wasn’t supposed to be serious about adopting another cat – she had come to donate towels and cat toys to the shelter. But she lingered. Asked if she might adopt, she slowly said, “Maybe,” her lips curling into a smile. Bishop took a seat next to Walnut, a 2-year-old black and white female, delighting in how Walnut looked at her with grassy-green eyes, pink tongue sticking out of her mouth every so slightly. “She’s so silky. That’s why I thought it was a kitten,” said Bishop, who learned Walnut’s tongue was out for a reason - all her adult teeth are missing. The waiting list policy for cats to be surrendered has its benefits but also contributes to the higher numbers of cats needing homes. Before waiting lists were instituted, when euthanasia was used, Browning said, the agency easily took in 75 cats on a typical summer day. Last summer, there was an 18-week wait for people wanting to surrender their cats. Stray cats also are responsible for the population surge. Christy and Luke Price of Sanborn, along with their 10-month-old son, Camden, were on a mission to find a cat Saturday. It looked promising when Christy hit it off with Sebastian, a gray cat with yellow eyes. “He seems so sweet and good around the baby,” she said. In the end, her husband and Sebastian didn’t quite hit it off so they changed their mind. But they weren’t giving up. “I don’t want a cat not happy with us, but we’re going to find our cat,” Christy Price said.